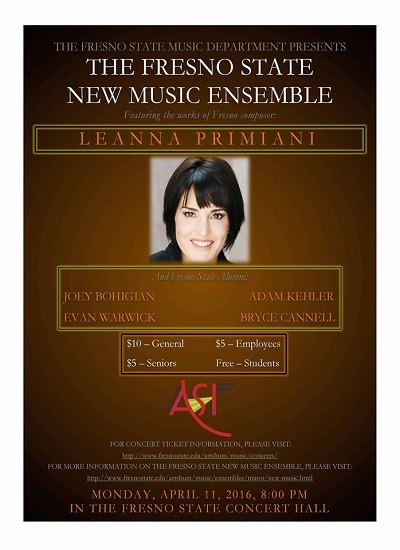 “On April 11th, the Fresno State New Music Ensemble will showcase a concert of Fresno composers, with Leanna Primiani as the featured guest artist.” And so, Fresno State professor and ensemble director Kenneth Froelich announces Primiani’s upcoming composer residency. He continues, “We’re all quite excited to have Ms. Primiani as our guest, and have planned several activities for her with both the New Music Ensemble and the music composition studio. Ms. Primiani’s music adds a great dynamic component to our concert, and it has been a great pleasure getting to know these works through our rehearsals.” Featured works include: Holy Order: Shaker Dances, In Memoriam, and Parada.